I'm sure many of you have had this experience: you read about a new fragrance. It sounds perfect. You start to build a smell-picture in your mind. You wait, and then you wait some more. It finally launches, but is only sold someplace inconvenient (there are few phrases in perfumespeak more dispiriting to me than "exclusive to Saks"). Finally, you get your hands on it. You spray, and — oh! It is not at all what you expected. Un Jardin après la Mousson is the latest from Hermès and the third fragrance in their Jardin series, and it isn't the first of perfumer Jean-Claude Ellena's creations to surprise me in this way, although more often than not, I manage to adjust. I liked Osmanthe Yunnan as soon as I smelled it, but it somehow wasn't what I thought it would be, and I could not help but feel a sliver of disappointment. By the time I reviewed it I was feeling much more positive, but even then, I had no idea that it would turn out to be one of my favorite summer fragrances. Likewise, I didn't get the spunky leather I was hoping for from Kelly Calèche, but my respect for Kelly Calèche has increased dramatically since its release; I've worn it often (and quite happily) this spring. So. My first thought on spraying Un Jardin après la Mousson was: cantaloupe! Followed shortly by: New West! I liked New West back in the day, but I just wasn't prepared for a melon-y aquatic note, and I wasn't entirely enthralled. Luckily, within seconds a whoosh of dry spice churns the melon into a froth (the notes: cardamom, coriander, pepper, ginger, ginger flower, vetiver accord). For a brief time, it reminds me vaguely of the spiced melon in Frederic Malle's Le Parfum de Thérèse — the Mousson could be the pale-fizzy-soda summer version*. The spices don't linger, though, and neither does the fizz. Twenty minutes in, I'm smelling transparent, indistinct florals over what is left of the cantaloupe, and a soft, dry base that recalls the "warm rocks" mineral note of Terre d'Hermès, minus the smoky gunpowder part. The vetiver accord is subtle and more clean than earthy. Un Jardin après la Mousson is much quieter than the others in the Hermès Jardin series (2003's Un Jardin en Méditerranée, 2005's Un Jardin Sur Le Nil). That's ok with me; you regular readers know I'm a Jean-Claude Ellena fangirl, and his pared-down style suits me to a T. But...so far, I don't adore Mousson. I don't hate it, nor does it leave me entirely cold, as Paprika Brasil mostly did. But I'm not feeling the love. It's a shame, since I now own lots of it (more dispiriting perfumespeak: "Sorry, we've only got the 100 ml size"). Admittedly, I haven't given it much of a chance, but since a few days of wear has done nothing to increase my ardor I'm going to set it aside for a month or so. We'll see how it wears in the heat of summer. So far, the reviews elsewhere seem to be markedly more positive than mine (I already linked to Victoria's review, and the early reviews on MakeupAlley give it five lippies out of five). An aside: it does layer nicely over the Terre d'Hermès, and also works well with a tiny drop of The Different Company's Sel de Vetiver. Hermès Un Jardin après la Mousson is available in 50 and 100 ml Eau de Toilette, and I believe matching body products are to follow. I don't know if it is sold in Hermès boutiques as yet (please comment if you've seen it there), but Saks Fifth Avenue does have it in stock. Update: Un Jardin après la Mousson will reportedly be exclusive to Saks and Hermès boutiques until September 2008. * And I suppose it is heretical to wish for a Diet Thérèse, but it strikes me now that such a thing, if done right, would be lovely to have. ….like you Osmanthe Yunnan caught me by surprise. I wasn't expecting to like it much, having been flummoxed by TDC's Osmanthus which, alas, smells like a big bunch o' nuthin' on me. But OY has a lovely scent and the added attraction of a serious staying power. So it's in my inbox. This is the release I've been waiting for all spring! I'm looking forward to sniffing it. I think Vetiver Tonka is still my favorite of the Hermessences, but OY is the one I wear most often. It really is perfect. I usually love anything w/ osmanthus, but the TDC version didn't do it for me either. I do very much like the new one from Parfum d'Empire. I'm looking forward to trying it, although the thought of cantalope is off putting, to say the least. It looks to be the prettiest bottle of the Jardin series; is it as pretty in person? Thanks for the description – yikes canatloupe? I will stay far far away from this one – melon in fragrance is one of the few things that can send me screaming in the opposite direction. Too bad, I often like Hermes and the name sure is pretty! Victoria describes it as watermelon, but it smells like cantaloupe to me…and don't know if the note is from calone, but people always say calone smells like watermelon, and I always think it smells like cantaloupe. Splitting hairs, I guess — it smells like melon. Very pretty. It's the only full-sized Jardin I have (I have 15 ml travel sprays of the other 2) so can't compare, but it's a lovely green at the top, fading into blue near the base. And adding — darker than in that picture. Sorry it's not ginger-love, Robin! Over on POL Mousson was discussed this week and lots of members got melon or fruit. For me, Mousson turned into a ginger root soliflore with little development or depth. Initially the scent evoked the slightly vegetal, cool crispness of cutting into a fresh piece of ginger. The drydown turned slightly floral, but was still mostly ginger. Three or so hours in I felt like I was wearing the pink pickled ginger they use as garnish at sushi restaurants. I share your love for ginger and JCE, Robin, but was disappointed by JCE's latest – if not for the pretty bottle and high price, I'd have thought I was wearing a Demeter. Do you think layering Mousson with Five O'Clock Au Gingembre (another ginger disappointment to me) would liven up both the scents? I really liked this when I tried it. With Kelly Caleche I ran out to buy it, and I think it was at the discounters in about three months after the initial release. So, I'm waiting on this one–I'm sure it will be at the outlets soon. That is my only real complaint about Hermes. Even after reading all the blogs that hated it (and I've found no one who loves it) I braved on to Saks, which in this area has an exclusive for 3 months, schlepping across the Valley following the directions of the nice SA at NM. OK, I'm an Elena fan, but I hate melon, so I entered Saks with great apprehension. This one is my favorite of the three and I am deeply in love with its transparency and the amazing aura of it. Yep, it does have a melon on the inhale, but on the exhale there is a floral element across the palate, which makes me think it's the Khali flower or a mix of the calone and the flower. It does fun, non-melon things in the hot sun, which endears it to me even more. I love the spice, although the pepper could be amped up for my taste. I get almost no ginger. If you have read The BOOK, you'll know I'm insane, and it smells the same on all of us. If you want to adjust it for a bit sweeter, use the body cream for Aqua Di Parma's myrtle fragrance, or just the shower gel, and you may find what you need. Or you can use Lush's body powder, Silk Underwear, for a sweeter jasmine base. I'm in love, even if I'm alone at the counter. Hey, glad you're with me. No love for it here yet. Haven't given it enough of a chance either, though. I normally love cardamom, but I found the heart and dry-down sort of indistinct. Even with the note list and description released ahead of time, I guess I was hoping beyond hope that it would conjure India for me and it doesn't. Perhaps I will eventually find it refreshing in the heat, but right now it just seems a bit, well, *grey* for that. Gosh, I wish I even got that much ginger — pink pickled ginger would have probably made me love it. 5:00 was less of a disappointment because I wasn't as excited about it, but I probably like 5:00 even less than Mousson. Layered — can't even imagine. Might have to try it! Really — all the blogs hated it? I've seen only a very quick blurb at Perfume Posse, and then the favorable review at Bois de Jasmin. Must do more reading! You know, I don't think all of that is skin chemistry (although skin chemistry, well, I've seen it in action). But I think it is also what you can smell, e.g, I think some people get olfactory fatigue to some notes quicker than others, and of course, some people are anosmic to certain musk notes, etc etc. Anyway, don't want it sweeter. I think I want it earthier, maybe? Spicier, for longer? Dunno. Never been to India, but it didn't conjure up anything even remotely like my idea of India. But that, I think, I could adjust to if I just liked the *smell* better. Ah well. Hope you didn't buy it unsniffed too. Oh no! I love the discount, too. Just not so soon after I paid full price! Aw, I'm so sorry it didn't work for you. I'm very happy that it's ginger and light vetiver on me (normally I'm not a big vetiver fan), and it may be the first fragrance I love that is entirely vegetal in nature. And yes, not a fan of Saks exclusives, and I also got the “we only have 100ml size available” – never mind a week later they had “discovered” their allotment of the smaller size *grumble*. But I love it, so I'm sure I'll use it up eventually (the cry of the fragonista!). I'm sampling this one today! And… I'm not happy. It's melon with white floral overtones where the spices should be. It's horrifying, actually. You all made me very curious now and I hope that I will see mousson very soon here. I love ginger and Montales Ginger Musk is quite good except when there is only the drydown left, then is is way too warm – maybe the two can be layered? Robin is ujalmousson a good 'waterscent'? I mean after so many water fragrances this could be such a relief. I like the way cantaloupe smells and in combination with ginger even better. Feel a bit worried about the cardamom, one note I do not like. Robin, I bet that this one will grow on you, even if it takes a few months. You being a Ellena fan, will give mousson many more opportunities, than many other perfumes. It took me over 6 months to even begin to like ujemediterannee, but now I do, and I kept trying it occasionally because so many NSTbloggers loved it. See, I don't think that vetiver is likely to please a huge vetiver fan, like me. Glad you love your bottle — did you buy it unsniffed or get to Saks in person? K, hope you didn't buy it too? It must be less horrifying if you don't already *own* it? Nil didn't conjure up Egypt for me either, but I didn't care because I adore the smell. This one, no. Maybe it will grow on me, who knows. The cardamom is very strong in the opening, but it doesn't last so perhaps it will not bother you. I tried it a few days ago. On my skin, all 3 of this series has the same “tomato stem” base more or less. Mediteranne I can barely wear as a strong woodiness comes out, giving me a terrible headache. Nil I like very much, and for me it dries down as a sort of dry citrus scent. Apres le Monsoon I was so anticipating–like everybody else, I was eager to have something in a different shade, so to speak. Well, on me, it really smells a lot like the other two. However, it does not have the heavy vegetal-woody quality of Mediteranee, and is not quite as dry as Nil. It is actually a lovely light scent that has enough green to not be bitter, and enough dry fruit and white flower to round it out a little bit. But I was expecting something more like Kenzo Amour or Costume National only with an Ellena twist–that, I did not get. I can't say I am in love, either, but if I had been able to try and compare all 3 before now, I probably would have picked this one as my favorite. I agree that a full size bottle is not necessary for me–probably a purse spray or travel size. “Diet Thérèse” — the Diorella idea but done with the melon-aquatic note of Calone? There is something you should look for, one of Roudnitska's last works (if not *the* last work), a cheesy-looking scent called “Ocean Rain” by Mario Valentino, which is exactly that. Discontinued, I believe, but still around online. We love it. Un jardin sur le nil does work very well on me, however. I wore it for a whole week several years ago when I started working at a boutique on Robson Street. I can still connect with my impressionable self when I use the scent. Oh, have been longing for this review for long. THanks! I do look forward to testing this in store although I am not sure if I'd like it. p.s. am absolutely loving Diptyque's fig perfume, which i bought very much based on your review, thanks! no other perfume cheers me up like it does. They will probably do a 15 ml travel size eventually — they have with the other 2, although they weren't sold separately, only as part of a coffret. But, it was possible to swap for them, or buy them on ebay, so perhaps you'll manage to snag one. T, is Ocean Rain spicy? Coincidence — just sprayed on En Passant. Yum. That is a very different kind of watery note than JALM — but it is “fresh” so know what you mean about lysol. You'll have to see if you agree w/ me on quieter than Nil. I think the dry down is, but maybe others won't agree. You might find the opening strong & spicy though. So glad Philosykos has another fan! Rats, I couldn't find the Mousson anywhere today. Neither Harrods not Harvey Nicks had it – though I'm sure someoene reported that they'd found it in Harrods. I'm dying to see the bottle if nothing else. The reports on this have been so…mixed isn't quite the word. I''m kind of looking forward to disappointment. I did find Lancome Peut-etre – and couldn't smell it at all. Honestly, the SA sprayed it on a strip right in front of my eyes,and it might as well have been water. I'm baffled. Harrods also had Dior Escale a Portofino in stock, but had nothing on display, and claimed to have no testers. Poo! And I was strangely impressed with Tom of Finland, of which I had no expectations at all. Plus I spotted Escentric 02 and Molecule 02, which I don't believe I've read about anywhere? Heavens no, I never buy unsniffed! But I was optimistic about this one based on the notes, so… I have not been wowed by very many recent releases at all. That is my rule too, but I break it at least once a year. I don't think it's been a great year either, despite which I've spent way more $$$ than last year, what's with that? That's odd, you'd think if Saks had it, Harrods or someplace like would? Drag about Escale a Portofino too, I'd love to know what it smells like! I'm dying to smell Tom of Finland — hear it's great. I reviewed either Escentric or Molecule, now I can't remember which one. Congrats on your EdS. I didn't love it, and haven't tried Shalimar EdT, but we agree on the parfum — it's wonderful. Want. So. Bad. To. Try. New West melon, huh? Well, I love New West and I am still psyched to try this – even though I've heard some similar sentiments on Basenotes. For the moment in my opinion “Jardin apres la Mousson” is not officially launched. In fact being a “New One” is a negative point (in my mind) for a perfume. I dont know why. I have never waited a perfume like a movie for exemple. Generally, I test a new perfume, I read about … and I forgot all during at least 6 months. During this time my mind begin its work … (you know the little voice saying that this perfume was not so bad). Thanks for the review and I'm sorry you found it disappointing. I'm a man who wears Un Jardin Sur Le Nil and always get compliments on wearing it. How do you think this one would work on a daily basis for a man wearing it? I have discovered the trick with getting Sur Le Nil to work and that's to underspritz, it takes the edge off the top notes which can be quite sharp if you go mad with it. Could be a golden tip HDS963.. the sharp topnotes bother me too after some time. Yeah, I'm glad I discovered it too! I absolutely love the heart of Sur Le Nil, but those sharp pointy bits take forever to die down! I find a light mist of Sur Le Nil gets the core beauty of the fragrance across and makes you feel great all the time you are wearing it. I hope Apres La Mousson is a good one for men too. I really did love New West. Haven't smelled it in years and can't remember if they still make it. Benoit, that is probably a sensible way to look at perfume, since you're more likely to pay more for the latest thing. HDS — you know, I'd call it unisex, but others have called it more masculine than feminine, and I had the opposite reaction, at least, until the very far dry down when most of the watery florals are gone. Me, I love sharp top notes — can't get enough of Nil's opening! I was really worried about this one…with the cardamom and coriander (i.e. the smell of sweat to me and the one reason I am not keen on Hermes Poivre Samarcande – – perhaps I should give it another try…), but was nicely surprised by it's mellowness! I don't get the melon scent, only ginger and vetiver, which I love. So this will be a great summer scent for me. I bought a 100ml bottle at Hermes KOP (PA), they have both sizes and I believe the lotion too. Glad you love it, at any rate! I went to Saks last weeken at the start of the F&F sale and basically demanded that they go in the back and get one. I was prepared to buy unsniffed (as I did with Lancome Peut-Etre that day) but another SA found the tester, so it was at least somewhat sniffed (but not fully, of course). I'm one of those bad fraggies that judges many scents by how well they smell on me in the first 5 minutes (I know, very bad!). I will say in my own defense that I have rarely been served wrong by the snap decision, however. Hmmm…well, I might go sniff it tonight if it's at Nordstrom. Then again, I might just wait. So many of J-CE's recent creations smell so much alike, I can't get all hot and bothered. I do love his OY (hugs to you, my dear), but other than that recent one, none of the others really suited me, although they are all well crafted. But I love the bottle to this one. The blue is simply stunning! Hey, good for you! I should have done the same, would have saved some $$. R, don't think it is at Nordstrom yet, but worth checking. The bottle is nice, otherwise, I'm not hot & bothered by this one at all. And taking a guess, but don't think you will be either. Hugs back! I don't mind sharp top notes either on the whole as long as they don't outstay their welcome! I like the Jardins so far, Mediteranee is a sometime purchase for me so I suspect Moussin might be too. What I like about them is that they are so refreshingly different to anything on the market – and that, is to Hermes' credit in my opinion! Of course I — like most everyone — can't wait to try this. Thanks for the timely review. I don't mind a melon accord at times either — and the sweet topnotes surprise me because I expected this one to be very cool, dry, and green. Definitely hope I like it — though I'm sure it will be awhile before I purchase a FB in any case. Trying to order a decant this week. I hope it is not that… I mean I like the note,but on my skin it quickly turns into a smell that I can only describe as… soggy carboard!!! It would be nice to have a travel coffret of these 3 in 30ml size. Regarding the layering… I am about to finally snag a bottle of Kiehls musk (arriving here in BA may the 9th, or at least the salesperson promised so ) and ready to begin the layering experiments. Also for layering, my Vetiver Brasil from El Boticario is proving very versatile. I would send you a decant If i didn't know absolutely for sure that it would be stopped at customs. So now that this Jardin is out of the hat… what is there next? what awaits us in the path of the always dangling carrot of “next new thing” ? In my list is the new Prada for men, TBA somewhere in 2008. What are you eagerly expecting R? Just curious. Come back & tell us what you think! There is, literally, nothing else I was waiting for as much as this — that is, nothing else I'd order 100 ml of unsniffed because I couldn't wait. But plenty of things I'm looking forward to — all the new CdG collaborations, and yes, the Prada, and I think we're supposed to get something from L'Artisan later this year, although now I can't remember what it is. I haven't the time or patience to sell things on Ebay. If I never get around to “standing it”, I'll give it away. A very nice person sent me a decant of this, and I have to concur with the aquatic melon, but alas, I get none of the dry spices that Robin describes. It's been seven hours now, and the melon is fading. I'm going to spray again when I get home, and do some housework, and see if the warm weather we're having here, plus the exertion of chores, brings out the spices. Yes, I get cantaloupe too, but very soon after, I get Gum(Spice) Drops. It fades rather quickly on my skin unlike Nil which lasts forever. I find myself having to smell my wrists five minutes after I spray it on and then its mostly floral with a touch of the spice. It's nice, but to me not a showstopper like Ellena's previous efforts for Hermes and TDC. No spices! That is not fair! Unless you love melon and hate spices. It is very sheer after the opening, agreed, although I did not have problems with lasting power. Agree, not a showstopper. Yeah, I was a little disappointed. I think my skin eats anything that is not really potent, so this Jardin series is probably not for me. Oh no! Melon?!! Say it ain't so! Say it ain't so! I avoid anything with melon (also anything with apple has me runnin' in the opposite direction). I have been to Kerala and none of what I'm hearing here reminds me of Kerala. I'll give it a spritz when I come across it out of curiosity though. Well, my nose must be truly wonky and dancing to the beat of its own drummer, because I just tried JAM — I mean, really tried it; at the store at lunch and twice now at home with a sample — and I love it, I really do!! Some people say this is melon O.D., but I love it. The first blast is incredible: exotic greenery and spices, especially cardamom and coriander seed, fresh and exciting, with a good squeeze of ginger juice. Then comes the dreaded canteloupe (some say honeydew, but I beg to differ). If you don’t like this sweet, dense, musky fruit note, you’re a goner, but if you do, there’s nothing like else like it (except, interestingly, the mango-centered Jil Sander Style, which must have taken a page from the same chemistry book). There’s also a gorgeous, sweet, slightly champaca-like floral note layered richly over the fruit which is unlike anything else I’ve experienced. The almost overripe sweetness is underscored by a firm stroke of vetiver to keep it in dynamic balance. I think this is a solidly beautiful and original fragrance. I dunno, Robin and the rest of the NST contributors; I kinda dig it. Robin, I hope something changes, cuz that is quite a whack of juice to have if you're not feelin' the love!!!!! Maybe, as you say, a run of great weather will suddenly make it come alive for you. I wouldn't be surprised. We've been having a warm, sunny spell and maybe that's contributed to the magic of it for me. . .Good luck! P. S. The SAs at Holt Renfrew Vancouver were unanimous in their disdain for Un Jardin Apres la Mousson. One said it was “honeydew melon over rot.” Clearly I am in the minority in my appreciation of it!! Could be I just don't yet have the experience to judge good from bad; I think I'm so keen on JCE, especially just having read The Perfect Scent, that I think he can do no wrong. Dana Cerise, perhaps you'll love it, who knows? Hey, Victoria at Bois de Jasmin loved it, so you're not alone! And way too soon to tell if it is going to “take off” like Jardin Sur Le Nil — for all I know, it will be the best seller in the Jardin series. Did you buy it? I do have a FB of Un Jardin sur le Nil, which I'm absolutely in love with. I also just bought a marvelously discounted bottle of Mediterranee online, which has grown on me over the months since visiting this site to the point where I love it nearly as much. And my respect for JCE has certainly grown from back in the day — oh, a year ago?! — where I wrote to say that L'Hiver lacked a certain va-va-va-vooom quality (well, DUH!) and failed to move me. Wow, eh? I am glad Victoria loved it. That soothes the savage bruised ego a bit. Thanks for mentioned BdJ. I MUST get away from Now Smell This more and start contributing to your learned friends' sites (if they'll have me). There's so much good writing and real camaraderie out there among you. I may join you in liking that one and I do like the smell of melons. She's something, ain't she? I love her; must spend more time on BdJ, and PP and the rest. I don't know why, but I really like your site's layout; it just is so easy to read/contribute to!! I hang around NST FAR too much! Have finally tried this in Harrods, but somehow I didn't get cataloupe at all. I was way way way overpowered by the very strong cardamom and couldn't really make out other notes… The cardamom stayed on my skin, very strongly, for a few hours until I couldn't stand it any longer and had a shower. I still have that sprayed strip of paper on my hand now and can slowly smell a faint hint of ginger flower creeping under the cardamom. I just tried this frag yesterday, my chemistry brought out huge amounts of the Melon and some ginger, it lingered for quite some time. The drydown (5 hours later) was very sweet, very much like a dessert but not in a good way. I'll go back to my Jardin sur le Nil, much better for me! I'll stick with Sur Le Nil too! Good morning Robin, they still make New West, I've seen it at Nordstrom's. Aha…I never had a childhood medicine that smelled like cardamom, perhaps that is why I love the smell. Seriously, at Nordstrom??? I will have to take a closer look, I haven't seen it there. Do you mean at the men's or the women's counter? Yep, just saw it today, I'm speaking of the women's version. I could take a look into the mens too. It's not on their website, but it's in the store. Thanks so much! I will ask at my local Nordstrom next I'm there. Finally had my chance to try Jardin/Mousson. I like it. It is not love to my nose, yet, but then neither was Eau des Merveilles and now I have a full bottle of EdM. It is very transparent, very elegant and modest and I love that gingernote. What I do not !! smell is melon or cantaloupe and I wonder if there even is cantaloupe in this perfume. I have to try Un Jardin apres La Mousson many more times to get familiar with it. There is no other perfume like this one and I may end up really loving it. I LOVE this perfume! I picked it up at duty free in the Montreal airport this past weekend and I'm completely smitten. The melon in the opening stage reminds me of the fabulously aromatic cavaillon melons we had in France last summer—the quintessence of summer AND melon. Those notes die quickly and then you have the sheerest (natch, it's JCE), most evanescent, magical hints of ginger and cardamom and the lord knows what all. I could smell it all day. I do. L, so glad to see you and so glad you found another favorite! Who knows, perhaps this one will grow on me. I just recently bought the 50ml bottle of Un Jardin Apres La Mousson, because, like most of you here, I was anticipating a new JCE from Hermes. So, here I am, having bought it unsniffed a few days ago, giving it a few days trial… and I really like it. A lot. As a young man, when shopping for something to wear through the warm spring and summer days, it is hard to find somehting that isn't the “summer” or “eua fraiche” version of something already retreaded on – these all undoubtedly carry “ozonic” or “aquatic” notes that are supposedly fresh and light for the hot weather. These all end up semlling like the “cologne and stale water” smell later on, just splashed with the men's staple citruses of the moment – bergamot and lemon. I hate those fragrances, not because they are generic (which they may be) but because they are pungent in composition while trying to be “light” – there is SO much involved in making a “light fragrance that it is almost ironic. I end up tasting the scent all day, rather than catching whiffs of it, and then I just get tired of it, rather quickly, becaus eI can taste and smell nothing else until I take a hot shower and use PLENTY of Litsterine! Okay, I'm exaggerating a tad, but you know what I mean. So while seeing things like Farenheit 32, Bvlgari Aqua Marine and the like, I decided I need to expand the thought process of where to look. I took to this blog to look for soemthing that wan't typically worn by men, in a environment where most fragrances are arranged by sexual identity. I didn't own any unisex scents at the time and didn't even think of unisex as an option, so when I stumbled on The Jardin collection here, I was intrigued. Of course, going into the city's perfume stores, all of the Jardins were stocked neatly under the women's shelf… so after a few moments of “should I/ could I?” I walked up, and grabbed a bottle of Un Jardin En Mediterranee, and sprayed it. The combination of figs with cedar wood was so different, so invigorating and fresh, that I had to buy a small bottle – just to last through the summer. It doesn't bare a “he” or “she” dominant side, which is what I think was the most interesting part of the scent. I could wear it and not smell like a “summer” man or woman, but just “of summer”, which is just what I was looking for. Consequently, I went back a few days later and tried Un Jardin Sur Le Nil, and now I own a small bottle of that as well. This was all a few months ago, just as the sun was starting to get some heat behind it here back in March; I was feeling the impending summmer weather, and the need to be prepared! So fastforward to now, where I bought Mousson unsniffed and I love it. I relaize it was such a risk doing something like that, but I own Terre de Hermes, Vetiver Tonka, Brin de Reglisse already, and I really like the two Jardins before Mousson, so I went for it; I am a JCE fan, no doubt. But, I could have disliked Mousson like others have just as easily. Luckily it paid off. It fits in there with the other two Jardins brilliantly – like the others it is transparent, opaque and light, almost a haze of a picture of where JCE went for inspiration. What surprised me though was the smell all together. I too, based on the press release for Mousson, thought it would be warm and spiced. What I got instead was cool and…damp. Yes, damp is the right word. The opening of cold cardamom and coriander is what I think is what some noses pick up as a “melon” smell; it is so cool and moist, that the mind just jumps to a bowl of balled melon. That, backed with that collective ginger, makes for a semi-sweet, slightly “soaked” smell of flowers and vegetation, like a heavy rain is passimg, evaporating and with the moisture in the air, smells of flowers, leaves, trees and fruit are faintly swirling about. In fact it smells like rain in a bootle – like an impedning thunderstorm: the cooling air, the sudden whiff of moisture, combined with the heated smells of everything around you. That “smell” has always been a favorite of mine, and Ellena's translucent and blue-tinted vision of that is wonderful, in my opinion. The “rain” smell is different based on where you are and how your nose picks it up, which makes the scent even more wonderful – like the rain smell, Mousson is a little different for eveyone. It even clings to the skin, just like that rain smell does, and the vetiver base makes it a little more raw, but tempered; you just feel like lightening may hit. It wears better on hot days, but is really good on wet days – the smell just wears rainy day weather like a favorite rain coat. Of the three, for me, it is clsoe second next to Mediterranee – which I can't seem to do without. Funnily enough though, I wear all three to work on and off, and Mousson is the one my female co-workers dislike the most. They all rave about Sur Le Nil when I wear it (one woman, who aworks with me in the accounting area told me the woody smell was almost edible! ), and they like Mediterranee. On a different note, the girlfreind likes Mousson on me better – she says it reminds of her of warm water near the coast… so there! But I love them all anyway. I can just see myself, a few months from now, perhaps October, when all three 50ml bottles are empty – I'll be ready to bust out my fall/winter scents, wrapping up in scarf and gloves, hot lattes and snow threatening to fall… but I will be looking forward to the time when I can get three more 50mls, one of each Jardin – it wouldn't be summer without them now. All three are amazing aren't they! In an interview with JCE I read that according to him these form a trilogy about water: Jardin Apres La Mousson is about the rain -the water that falls from the sky, then the water forms into a river – Jardin sur Le Nil that flows to the sea – Jardin En Mediteranee. There are no other fragrances like these three and I love the drydown of Jardin Apres La Mousson very much. I have subsequently tried this at the Hermes boutique at Selfridges and don't like it at all. It smells like a soggy swamp to me and is definitely the weakest of the three Jardins. Markolomeu, thanks for the very detailed review! Sounds like you've found a winner. Have you tried layering it with anything? I like Sur Le Nil over Terre d'Hermes, and it occurred to me later I should have tried Mousson that way too. Soggy swamp, ouch! Interesting that you find it weakest — I think it lasts longer than Sur Le Nil on me. But I like Sur Le Nil much, much better. A little layering here and there… but I haven't tried those combos. I should though 0 Terre de Hermes is kind of my signature, so you've given me something to think about. I layered Vetiver Tonka with Mediterranee once – it was bizzare, VERY green, slightly tart and dry, but kind of nice… amazingly, I find matching shower gels are great for buffing up the scents. All three Jardin gels lather really well and leave the skin smelling like a faded, clean-scrubbed version of the scent, with the most potent being the Sur Le Nil. Spraying the juices on after a shower in the respective gel is a great way to enhance the scent. All of the Hermes shower stuff I have tried so far is great (the botique in Lux is great with samples of stuff, some which I have received as a “gift” when I purchase other things), so after trying those out… I went back and bought the gels in 200ml sizes… they last for a WHILE, where a pea sized blob in the palm of your hand is PLENTY of lather. Thanks again. I've only tried the lotions — love the Sur Le Nil lotion, & would like to have some in the Mediterranee. Years and years ago, I used to live in China; my father worked for a major oil company and he accepted a job there. We stayed four years. I can count to ninety-nine, say thank you and “Hello!” when answering a phone. I was a child and didn't eat a lot; one of my favorites was fried calamari. (No doubt I liked it because it was western, didn't contain veggies, etc.) Wow, big deal, right? But it was the mixture in which you dipped the calamari that was really interesting to me: a mixture of MSG and pepper. It popped on your tongue like salty Pop-Rocks first. That bled into a tiny burn from the pepper. Then you got to the calamari. It was really fun, tasty, and not so good for me. Oh well. That's all my roundabout way of getting to what I thought of Un Jardin Apres La Mousson. Take the freshest, sweetest cantaloupe and dip it into that MSG/pepper mixture. It's sweet and it fizzes and, if you squint, you can make out some indistinct spice. It's fascinating: you can smell the froth and the cantaloupe (is it just a cantaloupe-like accord? It's weir that it isn't mentioned in the notes) is dead-on. But I don't like cantaloupe. It's too sweet. In fact, I'm always telling my friends that melons of all kinds just taste like sweetened water to me. So no. I won't be buying a bottle. I probably won't be going through my 2ml sample. I can almost guarantee that it won't warm on my skin again. I smell it every three seconds and it's just getting sweeter and more watery. I admire it, I really do. It's a truly unique olfactory experience. But it's not me. This is my bottom of the series. I can't really remember Sur Le Nil when I sprayed it on my arm, but I remember en Méditerranée won out. Still, if forced between Apres La Mousson and a lot of other scents, I'd definitely pick this. Oh well. I'll definitely try this with my Terre d'Hermes (which I'm still not sure if I like; I can't stand anything orange) and get back to you, though. Very funny — I spent some months in Thailand as a child and all we wanted to eat was fried shrimp, for about the same reasons. Apres La Mousson seems to be more of a “love it or hate it” than Sur Le Nil or Mediterranee. I think I'd adore it if they left the aquatic melon out, but then, I wouldn't be surprised if it sold very well — aquatic notes are very popular. Yeah, true ethnic food seems to be lost on a lot of children. It's a shame. Now I wish I'd been more adventurous. I can't imagine going back any time soon. I can understand how someone could love this, but I just can't get there myself. And you're right, I haven't heard much discontent over the other two. I really can't imagine it without the melon accord, but I'm kinda glad I didn't like this. I can't really afford too much perfume right now, especially since it hasn't hit discounters. Now, do you know if the series is just a trilogy? I hadn't really discovered perfume when the first came out and I have no idea if this is just the latest or the last. I've never heard it was planned as a trilogy, so sort of assumed we'd see another one eventually, but I don't know. Oo, that's sounds promising. I do hope I like the next one better. after some days I think this is gorgeous on men – i love it, but not for me. it is fascinating, though. This is actually quite suprising to me – it seems like not too many people love this fragrance. It felt like everybody was talking about it loooong before it hit the stores, people were very curious. Now that it finally is launched and in the available in some stores… there is some bad reviews to be found all over the perfume blogs! I mean c'mon, this is SUCH AN AMAZING FRAGRANCE! If You don't appreciate Ellena's spicy, vegetal approach at least admit it, this is a unique scent. Not another Acqua Di Gio, not another teenage CK whatever eternity, infinity whatever thet call it… THEY R ALL ALIKE. This is an unusual complex of scents that captures beautiful moments in India. Every time I smell any Un Jardin scent it feels like it is made by someone that CARED, and enjoyed making that fragrance for a special perfume house – hermes. 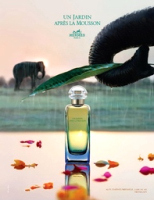 Un Jardin Apres La Mousson is THE FIRST “acqua” fragrance that is looooooved by me so much! I normally am soooo sick smelling ANY water-based fragrances, it kills my nastrals! Perhaps because Ellena combined acquatic notes with beautiful, and my favorite, ginger and cantaloupe, sprinkled it with cool spices, it makes it a deep scent. PLEASE GIVE IT A TRY, or at least appreciate his effort. IrisN, I agree, it is a very well-designed and unique fragrance, I totally hear your frustration on the Aqua/CK/Happy-teenage smell. Unfortunately, I bring out huge amounts of melon with Jardin Apres La Mousson, I like it on others, but not on me. The other two Un Jardin scents are lovely on me, so two out of three isn't bad…. you used to live in Thailand ? I'd smelt others of this line but It wasn't strike me that much. They're just okay. But when I smelt this one. It is AMAZING ! It's something I'm looking for. The combination of spiceness and cleaness got me ! another new fragrances, another fights ! My Dad lived there, I really just spent a few months there. And I wish I remembered it better than I do…but do remember the temples, and the apartment where we lived, and some things about downtown Bangkok. Would love to go back! Anyway, glad you loved the Mousson and hope you'll find a cheap bottle. White Patchouli is still fairly new here too, perhaps you'll find it later in the year? Still, would like to see it again after so long. I LOVE this. Somehow it appeals to my body chemistry. This is a good scent for concentrating on big things at the office. When I sniff it, it smells different. When I spritz it on my skin, it keeps changing and I dont smell fruits at all—- more like vetiver and woods. Perhaps its my body chemistry. Husband loves it ! Marianne, you will be surprised how many French and German women actually like Mousson :)) I saw them buying in a huff in several stores and it seems like they need it like water. De Nil wasnt chosen among stores I visited. Perhaps the weather ??? PolarBear, so glad it works for you ! I went back to the store and got a sample of de Nil again. This time, I was not in a hurry, and I am starting to really like it. I bought a bottle of course and upon reaching home, hubby said he likes it. THANKS !!!! The top note definitely smells like cantaloupe. Although melon-y scent is very common, i’ve never tried something that smelss like cantaloupe. – it is a bit disturbing. But I like it when the top note tones down a little. As the time passes it smells fresher. For even more cantaloupe, try Delrae Emotionnelle. It’s uncanny — just like biting into one.